No matter what type of party or event you are holding the Hog Roast Salford team is here to help. We offer a top notch catering service that is highly respected in the area and used repeatedly by hundreds of customers. Over the years, we have built up a good understanding of what it takes to keep every single guest happy and full of good food. Our chefs and catering team are all fully trained and take a real pride in their work. When you hire us, you are assured of the best service possible. Despite the fact that tastes have changed drastically, over the years, hog roasts still remain popular. In fact, they are still the celebration dish that we are asked to cook the most. People love the sight of a whole hog turning majestically on a spit. They look forward to tasting the succulent pork and crispy crackling. Whether you have it served in soft baps, with stuffing, or plated up as part of a formal sit down meal roasted hog meat tastes divine. However, at Hog Roast Salford we appreciate that it is important to offer people as much choice as possible. With this in mind, we have developed a range of party menus that feature every type of food imaginable. Using the dishes we have on offer you can easily put together a party menu that is tailored to meet every guest’s dietary needs and tastes. 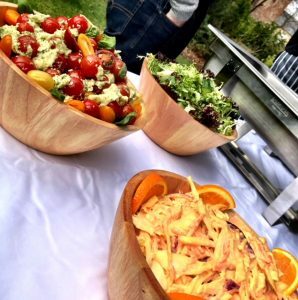 As well as barbecued or spit-roasted meats, we offer a huge selection of side dishes, desserts, canapés, steamed vegetables and more. Everything is perfectly cooked and presented to your guests. Our team will lay everything out as a buffet, or we can provide you with waiters. There is also the possibility to hire a modern spit-roaster from us. We can deliver it pre-loaded with meats, or you can provide your own. It really is up to you. Either way, a member of the Hog Roast Salford team will take the time to train you on how to use the hog roaster. To hire us all you need to do is to provide us with your contact details and the date of your event. One of us will then ring you back to finalise the arrangements and confirm the booking.